Aviation industry is growing rapidly and airports are creating a positive impact on social and economic well-being of the community they are located in. But it is also causing negative impact on environment and nature with critical issues such as energy, pollution (air, water, and sound) and exploitation of natural resources. Airport mega-structures have a bigger responsibility on them. Being giant resources guzzling system, Airports can no longer afford not to go green and be sustainable. In future, all the Airports would go for the stringent ‘Sustainable Guidelines’ ensuring consumption of minimum natural resources viz. energy and water, highly efficient waste management and overall less carbon footprint. We could also say that futuristic Airports a.k.a. Sustainable Airports will be in seamless harmony with nature and provide better and healthy environment. If we see the current scenario, sustainable green buildings norms such as LEED, IGBC, and GRIHA are gaining popularity among airports developers and owners. Airport Authorities are gradually adopting these global standards which encompass multiple innovative techniques such as high-efficient glazing system, efficient and automated lighting systems, green materials and chemicals, water harvesting, water recycling, waste management etc. 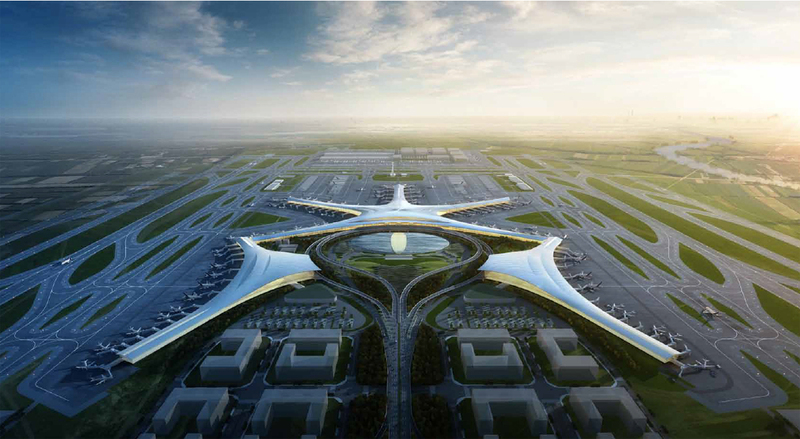 In a longer run, we would see futuristic airports developers targeting beyond green building certification. In due course, airports operators will go for self-enhancing processes to improve the sustainability index beyond the tailor made solutions. By Sustainable development, we aspire to meet the needs of the present without compromising the ability of future generations to meet their own needs. This could also be explained with the idea of “Triple Bottom Line” viz. Economic Growth, Social Responsibility and Environment Stewardship. In the present time there is significant awareness about going green. Once a complex jargon ‘Sustainability’ has now become a need of our era. In future, Airports will go beyond the green tag and will try to be sustainable backed up with overall performance and efficiency. On the energy front, most airports will be net-zero energy consumers, i.e. they will be self-reliant in terms of their energy needs and will not consume any power form the grid. Let us understand this based on demand side and supply side energy usage. On the demand side, airports will be designed in a manner by which there is no lighting consumption during daytime operation. Besides, architectural design features to get in optimum, glare free light (At the new T2 Terminal at Mumbai, lenses have been used in the sky lighting to bring in glare free, diffused light), new technologies like light pipes, light catcher domes, natural lighting with fiber optics, etc. will ensure nil artificial light usage during daytime operation. Proper design and selection of envelope material will reduce the air-conditioning heat load to bare minimum (< 1W/sqft) even for tropical countries, new HVAC technologies like radiant cooling system, under floor air distribution technology, geothermal systems, absorption chillers, magnetic levitation chiller compressors, etc. will reduce power consumption towards air-conditioning to near minimum. Not only innovation in design and technology, but also the operations of futuristic airports will enable modular usage of zones enabling switching off zones which are not functional. There would be single window to check in for all air lines or maybe technology will eliminate the need of checking-in itself. People can just drop-in their luggage at a single window and move on. This operational change can impact a big ticket savings in terms of energy usage in processes and operations. Calibrated simulation to monitor, benchmark and bridge gaps in energy usage will be the norm. Calibrated simulation arrives at the energy consumption patterns for the large buildings through whole building simulation technique, then online, 24X7, compares the actual usage pattern with the simulated consumption to identify gaps. This ensures peak efficiency 24X7, factoring all variables like weather, usage, loading, traffic, etc. All this, back by proper design of supply side of energy, using myriad renewable technology and fuel options, will lead to net zero or even a net positive energy establishment. Mapping of all possible energy sources be it solar, wind, geothermal, fuel, etc. should be done, their full on site potential explored and strategies to harness them to the maximum, explored. Much merit is there for such evaluation as much land is available for an airport considering the airside land availability to easily target this feat. In India, Kochi airport has already achieved the feat of first net zero energy airport in the planet through solar power. Proper indoor environment quality is a must for any airport. People of different nations, regions, businesses, medical patients, etc. converge on an airport every minute, every hour. The issue of contamination of indoor air and to ensure that it always stays healthy for all is indeed a challenge. Adequate fresh air ventilation, filtration to trap even sneeze droplets of H1N1 infection, acceptable oxygen levels at different traffic levels, etc. are indeed a challenge. The balance of fresh air requirement along with optimization of energy usage to treat this fresh air makes this challenge even trickier. Futuristic airports will create their own fresh air without taking any outside air for this problem. This will ensure a healthy indoor environment with nil energy consumption in air conditioning outside fresh air. We all know the importance of water and its conservation. Presently, in many countries including water scarce and dry areas like Middle East, the importance of water is not been given adequate weightage as the costs of water does not permit a business case due to negligible cost or unregulated process. However, it has started gaining momentum and majority of decision makers are giving water its due importance irrespective of a business case. Beyond doubt, there is indeed a case for a net zero requirement of fresh water for an airport especially for tropical Indian weather. Recycling of waste water for multiple usages like flushing, landscape, cooling tower water makeup, etc. is already in vogue. Infact at T2 terminal of the Mumbai International airport, we have even recovered the condensate from all AHUs and that water is being fed into the cooling tower basin for its makeup water requirement. Not only this saves water, but also reduces the energy consumption of the chillers due to a reduction in the cooling water temperature by the cold AHU condensate water. Considering the size and space available at airports especially on the airside, one could harvest all the rain water in storage tanks and use them to meet its fresh water requirement. Futuristic airports will surely be sensitive to waste generation and recycling. With proper segregated collection of waste, one could easily achieve 100% recycling of all waste generated. Most forward looking organization, food chains, hoteliers and retailers can collectively get together and achieve zero usage of virgin raw materials for all their requirements. Futuristic airports shall be designed and operated in a manner by which they will first map the resources that nature have provided for them and continually monitor how much of these resources are being utilized by them. This will indeed be the ultimate measure of sustainable and green performance of a future airport. Initially, Conserve Consultants started off with a feasibility study of the project to evaluate if an airport of this size and scale could comply with sustainable building norms and requirements. On completion of the study, it was observed that the project was on the borderline to meet mandatory norms as prescribed by LEED India governing body. Even if we were able to overcome the mandatory requirement challenge, the study indicated that the project would be able to achieve just a basic or silver rating. The Team at Conserve Consultants then proceeded with analysis of simulation results, performance gaps and bottlenecks in the project, and after numerous iterations the areas of improvements were zeroed in to meet the norms. The project team reworked upon the design and specification and after simulating the redesigned specification the mandatory ASHRAE baseline was met with a savings of INR 60 million. Despite numerous challenges, all the stakeholders viz. GVK, SOM, Ch2MHill and L&T team were motivated to achieve a higher level of rating. We collaborated and set a target to achieve silver rating. The “Performance Delivered” was an energy savings of INR 310 million lower than the ASHRAE baseline energy cost, which at the beginning was an insurmountable challenge. Overall annual water savings was 34% over the LEED India baseline. The indoor air quality and thermal comfort parameters exceed conventional airport requirements. This difference can be felt and noticed while walking through the T2 terminal. The substantial reduction in the usage on natural resources has been made possible by strategic green sourcing, thereby reducing cost. Some ingenuous methods such as signage for empty parking space have been able to reduce the fuel consumption of vehicles as well as time of the visitors and passengers. All the sustainable features incorporated in the project have finally resulted in Mumbai International Airport T2 Passenger Terminal being one of the Greenest Airport Complexes in the World. Mr. Juzer S Kothari is Managing Director of Conserve Consultants. He holds a Bachelor’s Degree in Chemical Engineering from the prestigious IIT Kharagpur. Mr. Juzer is one of early adopter of green building technologies in India ; a LEED Accredited Professional (from United States Green Building Council-USGBC) since 2007 and a Certified Trainer for GRIHA Rating System. He is a part of ‘Train the Trainers’ faculty programme of National Renewable Energy Laboratory (NREL), Department of Energy- USA, for their Energy Simulation Software. A Certified Energy Auditor and Manager from Bureau of Energy Efficiency, Ministry of Energy, Government of India and ECBC Empanelled Expert (Energy Conservation Building Code, a UNDP-GEF-BEE programme). Mr. Juzer has been in the energy industry for the last 30+ years including 11 years of super specialized expertise pertinent to high performance, sustainable green buildings.He is the recipient of LEED Fellow Award 2016 by GBCI-USGBC for his pioneering contribution to green building movement.